DM Metalloys Pvt. Ltd. leading manufacturer, exporter and supplier of stainless steel BA finish of 304/304l/316/316l strips. Bright Annealed (BA) is shaped by heat-treating (annealing) in a measured atmosphere heater. It has a mirror like attendance but may have some muckiness and other imperfections. A finish that is designated "BA" has only been bright annealed. A nominal amount of roll pressure (skin pass) is realistic. The process recovers flatness and finish consistency but does not significantly decrease thickness. Bright annealed 304/304l/316/316l stainless steel strips are sometimes buffed to attain a more mirror-like finish. DM Metalloys Pvt. 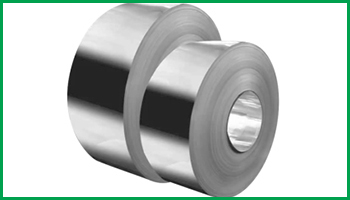 Ltd. Supplies Stainless Steel 304, 304L, 316, 316L BA Finish Strips in Faridabad, Gurgaon, Gurugram, Gaziabad, Noida, Lukhnow, Delhi, Delhi NCR, Ludhiana, Amritsar, Chandigarh, Jalandhar, Baddi, Punjab, Uttar Pradesh, Haryana, Mumbai, Pune, Sahibabad, Meerut, Manesar, Bhiwadi, Bawal, Neemrana, SIDCUL, Sonepat, Ambala, Mohali, Panchkula, Kapurthala, Bareli, Kanpur.